Architecture in Helsinki’s career has been marked by a slow distillation. Each record has had a sharper focus than the last, giving them a clearer, more articulate pop aesthetic with less and less indie whimsy. It’s a matter of taste, really, which you prefer. It’s a matter of execution if the record is good or not, and Now + 4Eva’s approach to synth pop -- in an era where CHVRCHES, Dale Earnhardt Jr Jr, and others have come along and perfected the formula -- is fine, but doesn't achieve anything special. 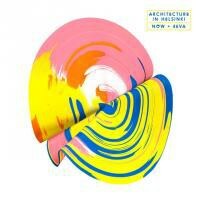 In the mid-2000s, Architecture in Helsinki was one of the only indie, electronic pop games in town with any notoriety. Now, ten years after the band got their start, electronic pop bands have hit critical mass. That, plus the band’s decision to pare down their multitudinous approach to instrumentation, and the once-charming, bombastic band behind “Heart It Races” feels downright pedestrian. Now + 4Eva features the vocal sampling and nappy, crusty synth textures that have become commonplace as its primary tools. There are a few brass flourishes, and a certain 1980s throwback vibe that tries to set it apart, but that barely works. Controversial opinion alert: I prefer the sharper focus of Moment Bends to the cacophonous, meandering Places Like This and In Case We Die. Moment Bends had just enough personality to rise to something other than a bland, generic electro-pop record; its disco pedigree proved something that had been missing in pop music for a while. Now + 4Eva is all but devoid of personality. The record is especially front-loaded. “In the Future” is a promising opener, with the band’s signature boy-girl-boy-girl vocals, funky lyrics, and staccato, percussive lead lines. We even hear strings and brass, though they’re synthesized. The immensely catchy “When You Walk In The Room” uses up all the "good notes" to channel the late 1980s, like a Paula Abdul B-side. It’s really refreshing, but less so when “I Might Survive” tries to ape Madonna on the very next track. We get it, you’re going for a retro thing. “Dream A Little Crazy” is another keeper, a Motown campfire singalong delivered by Mick Jaggeresque vocals. Things get pretty tired later in the record. “Boom (4eva)” has the prettiest chorus, but lacks momentum in the verses. “U Tell Me” keeps with the '80s aesthetic, but tries to mimic Tears For Fears and doesn’t succeed. The record finishes with a departure from the 1980s, the disco-infused “Before Tomorrow”, which has the habit of grinding to a halt as soon as it finally gets going. There’s nothing else on the record worth mentioning. These songs are devoid of personality, hook, and interest. The second half of the record is particularly boring. The problem here is Architecture in Helsinki have removed the zany, throw-it-all-in, kitchen sink approach to songwriting. There’s a lot less variety and momentum. That would be fine if the band proved able to write 11 really good pop songs, but this record has maybe three. There are six or seven great pop music ideas elsewhere on the record, but those are couched in bland, overwrought, formulaic, synth-pop drudgery. Now + 4Eva is a bland record from a band that used to be anything but.